Ever have those days where you're stuck in a rut with your clothes? Recently I've felt as though I keep re-wearing the same 3 tops again and again, paired with my favourite pair of black skinny jeans. We've all been here right? So I decided to look through my wardrobe (AKA my lovely Kallax from IKEA) and picked out things I've hardly ever worn. I was over the moon with what I found. I came across this beautiful striped shirt from Zara at the bottom of one of my boxes, it's ridiculously soft and silky - making it flow rather effortlessly when you wear it. I just folded up the sleeves for more of a casual look and instantly fell in love with it. I had recently been on a weekend getaway to Waterford and visited a great vintage store while I was there, called The Vintage Factory (read more about my lil adventure here!). This got me feeling all the vintage vibes, so I decided to pair the shirt with some high waisted blue denims. It just had to be my Farleigh jeans from Asos. Note : these jeans are the perfect blue colour, they're comfortable, easy to wear, and go with just about everything! A must have in every wardrobe. 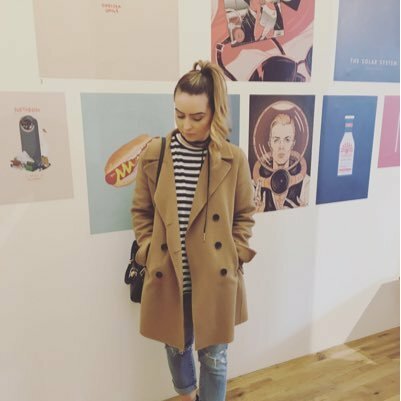 I paired the outfit with my go to boots from Zara, and yes, they were €19.99... I'll never get over this! They're easily my favourite black boots, with the perfect heel height you can walk for hours and still feel chic. Bag wise - I went for my Kurt Geiger Micro Dee bag, I'm all about small crossbody bags and this has to be one of the best. It's super vintage looking - so I paired it with a silk scarf I bought from Topshop last year. I always do this with bags lately, just to make them that bit more unique. If you've any bags laying around that need a spruce up - just tie a scarf to it and violá, say hello to your new favourite bag. Just as I was about to leave my apartment I had to grab a coat, as we all know how unpredictable Irish weather can be! Of course, I couldn't find anything of mine that went with the outfit. I knew I wanted something oversized and black, where as everything I owned was too long or too short. Overall, I was so happy with this look. It really got me to appreciate what I have in my wardrobe (I just need to trawl through my boxes a bit more!). This was the perfect outfit for a casual day in the city whilst still looking effortlessly put together. Just to note - I discovered my new favourite hot chocolate spot on Dawson Street. The guy making my hot chocolate was the nicest - he spent forever creating this beautiful Puffin art on the top of my hot chocolate. A must if you're in Dublin, go check out The Beanhive (Clo recommended! ).